This four-volume hardcover facsimile edition of Codex Mendoza places the most comprehensive, most extensively illustrated document of Aztec civilization within reach of a broad audience. Compiled in Mexico City around 1541 under the supervision of Spanish clerics, the Codex was intended to inform King Charles V about his newly conquered subjects. The manuscript contains pictorial accounts of Aztec emperors' conquests and tribute paid by the conquered, as well as a remarkable ethnographic record of Aztec daily life from cradle to grave. This four-volume publication is an unsurpassed source of information about Aztec history, geography, economy, social and political organization, glyphic writing, costumes, textiles, military attire, and indigenous art styles. 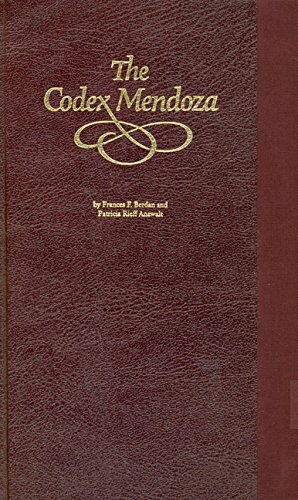 Volume 1 contains interpretive essays by the authors and other leading specialists on every aspect of Codex Mendoza. Volume 2 offers a thorough description and discussion of each pictorial page, and Volume 3 is a complete color facsimile of the manuscript itself. Volume 4, a parallel image volume, is the most innovative and in some ways the most useful of the four. It provides an exact duplicate in black and white of the facsimile Volume 3, with the sixteenth-century Spanish text transcribed and then translated into English. In addition, all the glosses are translated and positioned exactly as on the original pictorial pages. The extensive and useful appendices add such things as pictorial charts of costumes and textiles, translations and discussions of all the glyphs in the codex, and a table of comparative chronologies. In making this extraordinary sixteenth-century work accessible (the original manuscript resides in the Bodleian Library, Oxford, England), the authors have performed an invaluable service to Mesoamerican scholars and all those interested in pre-Columbian peoples.